Allison Wheaton is the Executive Director at Summit Equestrian Center in Fort Wayne, IN. She grew up with horses and knows first hand the therapeutic benefits they bring to our lives. Allison began her career in Equine Assisted Activities & Therapies because of the power that horses have to help people. Initially, she was drawn to riding therapy for the physical benefits that horses bring children and adults of all abilities. As her experience evolved, she watched her riders request to participate in ground based activities, craving the connection and learning opportunities that come when working with horses on a level playing field. These experiences encouraged her to continue her education through the Equine Assisted Growth and Learning Association (EAGALA) and Eponaquest. The dynamic environment that comes from being connected with a horse provides the opportunity for so much growth that it is humbling to facilitate. Allison founded Summit Equestrian in 2010 and started collaborating with Motion For Life in 2014. I am a Certified Equine Sports Massage Therapist and a Certified Equine Rehabilitation Therapist. I began practicing traditional massage therapy in 2004, where I quickly saw the benefit of a more holistic approach to the well-being of the horses under my care. In 2012, I joined the Motion For Life team and began developing the program that now services equines, canines, bovines, and a varied assortment of other athletes and pets. My story includes my own struggle with limiting pain that, by the time I was in my mid-twenties, had severely impacted my quality of life. Through the blessing of myofascial release therapy and the unique approach at Motion For Life, I have had my life and my physical comfort restored to me. I am proud to manage Motion For Life Integrated Animal Services because I know the power of our treatment modality to change a life. Our animals' physical, emotional, and behavioral health are all integral components of their well-being. At Motion For Life, we address each animal's needs individually, and fully invest in the outcome of your animal's treatment. We look so forward to meeting you and your animals! 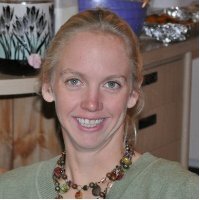 Lisa Freed is a recent graduate from Ball State University with a degree in Psychology. Lisa grew up riding horses and has always enjoyed working with them. 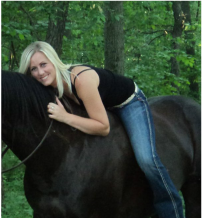 While at college she had the opportunity to ride on the equestrian team. It was through the team that she was introduced to Equine Assisted Learning. She has completed her first course of EAGALA (Equine Assisted Growth And Learning Association) and is one of our equine facilitators. Lisa also treats horses using Equine MFR. In her spare time Lisa enjoys spending time with friends and trail riding. 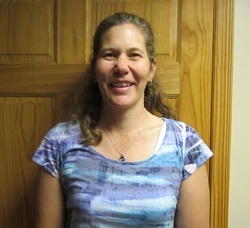 Lisa has great intuition and her kind and compassionate spirit will help facilitate healing in humans and horses a like. She is a wonderful addition to the team at Motion For Life!